The 36th President of Jogye Order, Ven. Wonhaeng pledged to open the dor for future Buddhism through recovering the spirit of monastic community and social contribution according to Buddha’s teachings with the means of communication and cohesion, innovation. President Ven. Wonhaeng promised to open new history and future of Buddhism through managing the order together with all members of the Buddhist community, strengthening the social contribution aspect of Buddhism and expanding intra-Korean Buddhist exchange projects,. He emphasized the fact that he will promote cohesion within the community bye creating a committee for communication and harmony and listening to district head abbotts, members of central council for better management of the Order. He also announced the establishment of a committee for promoting Buddhist culture in near future to open a new era of Buddhist culture with Korean people. On that day, Ven. 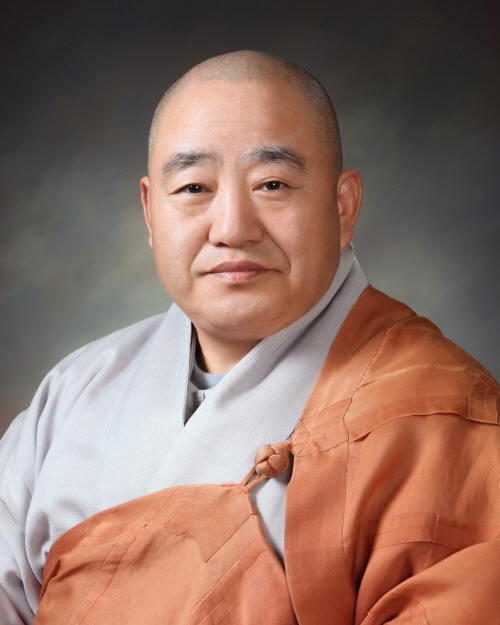 Wonhaeng especially focused on his goal to work with all members of the Buddhist community to put out the change and innovation of the Order as the vision for the management. As more specific plan for realization, he suggested institutionalization of Korean Bhiksuni Association, the creation of the monastic community fund so that all of the Buddhist followers can actively contribute to the unity and restructuring of the Lay Buddhist Association. Ven. Wonhaeng also requested to the government a comprehensive review of the policies related to traditional culture. At the ceremony, 5000 people participated including monks represented by Supreme Patriarch Jinje, politicians, leaders of the society and Buddhist followers to congratulate the inaguration of the 36th President of Jogye Order. I would like to express my reverence for the Most Revered Supreme Patriarch Ven. Jinje, the Members of the Elder Council represented by President Ven. Semin, all the monks who are pouring out their efforts for preserving the temples and propagating BUddha’s teaching and all our lay followers. I also express my deep gratitude to President Moon, Jae-in for sending a congratulatory remarks to make today’s occasion more meaningful. Also, I welcome and thank Minister Do, Jong-hwan of Culture, Sports and Tourism, Chair of National Assembly’s Buddhist Association Honorable Joo Ho-young, other Members of the National Assembly, Archbishop Kim, Hee Joong, leaders of other religious groups in our community, leaders of other Buddhist orders, Vice President of Buddhist Association of China and ambassadors from all around the world for taking time out of your busy schedule to attend today’s event. I also express my sincere appreciation to Chairman Kang Surin of North Korean Buddhist Federation for sending a special congratulatory message. We are also joined by children of Seungawon Orphanage who are living together transcending their differences of being with disabilities or not through pure hearts and dreams. Also, we are joined by the victims of Japanese wartime sexual slavery from House of Sharing, a shelter I was lucky to have had the opportunity to support. Thank you. Dear highly revered elderly monks and all attendants! My shoulders are heavy with the responsibilities I have been granted as the 36th President of Jogye Order from my fellow members of the Order and citizens. However, I stand here with an desire for change and innovation of Korean Buddhism. I humbly pledge in front of the members of the Order and citizens to fulfill the duties to the best of my abilities, acknowledging that the path we have to walk is not an easy one. In the recent past, our Order has gone through a turbulent time. We had to find the root of the problem and solve it through logical and institutional approach, but we could not do so. I, as a member of our community, cannot be free from such responsibility as well. I would like to make my apology to the member of the Order and the citizens. At this occasion of inaugurating as the 36th President of Jogye Order of Korean Buddhism, I would like to return to my mind as a beginner. 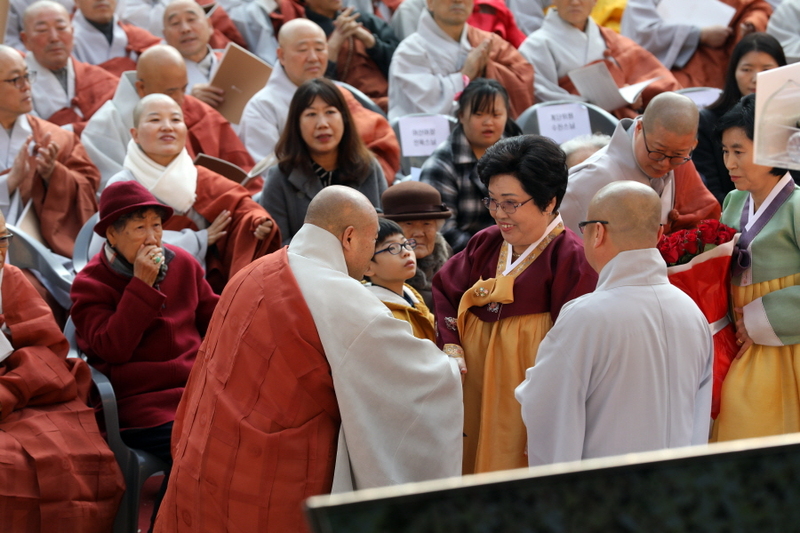 From this moment, I will be the President who can make a new future for Korean Buddhism through constantly working together so to ensure monastic community, Buddhist followers and everyone can take up our proper duties and roles. I will promote communication and harmony while planning for future of Buddhism through innovation. The 36th Administration of Jogye Order will recover the spirit of our monastic community through the motto of communication, harmony and innovation while spreading Buddha’s teachings to our society to plan for the future of Buddhism. I will establish the committee for communication harmony to promote the harmony of our community. If there are those who are willing to express their voice about the internal problems of the order in a constructive manner, I will welcome them with an open heart and continuously make forums for such discussions. I will ensure that the new committee will play the role of a rational mediator and coordinator for the issues of conflict. I will strengthen the communication among the members of our community. I will regularly meet with the abbots of district head temples and the members of the Central Council to listen to their opinions about the management of our Order. Specifically, I will listen to the opinions of the abbots of district head temples regarding enhancement of the position and role of each districts. I will also make forums for all monks and lay followers to participate in order to understand where the members of our Order are standing regarding each issue. With Korean people, I will open a new era for Buddhist Culture. 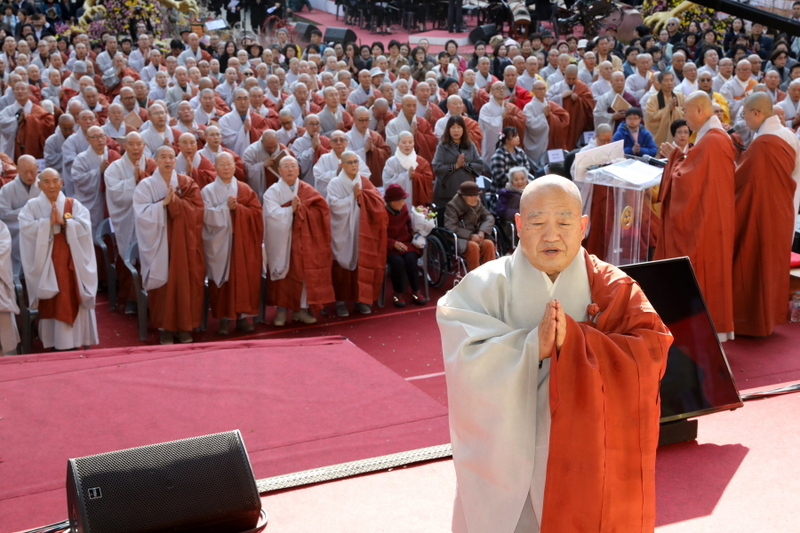 Korean Buddhism has diverse tangible and intangible traditional cultural resources. Recently, “Sansa, Buddhist Mountain Monasteries in Korea” consisted of 7 traditional temples was registered as UNESCO’s World Heritage. As such, our Order will establish a committee for promoting Buddhist culture. In order for change and innovation of the Order’s management, I will be the first to change. Currently, the President of Jogye Order is the head of all corporate bodies created by the central administrative institutions. I will try to separate and distribute such authority to each corporate bodies to increase their responsibilities and expertise while strengthening the power of the Order’s central administration to supervise them. The 36th Administration will try our best for efficient and detailed changes and innovation of the Order through a common vision of order administartion with everyone in our community. Especially, we will focus our efforts for development of our Buddhist community and order management participated by everyone in our community. We will institutionalize Korean Bhiksuni Association and strengthen the authority of 6,000 Biksuni monks through enhancing their rights to participate in the administrative bodies. We will promote the creation of the monastic community fund so that all of the Buddhist followers can actively contribute to the unity of the end. Through the institutional improvement, we will support the creation of funds and utilize the provided resources for monks' welfare. I will pay special attention to the welfare issues of monks who do not have a job and are practicing in solitude. We will actively cooperate with the Lay Buddhist Association for Jogye Order of Korean Buddhism to restructure the organizations of lay followers. I will make this year the year to fulfill the responsibilities as Buddhist followers. Together witl all Buddhist followers, I will make dedication and service for the personal development through promising to live as a Buddha and new leap forward for Buddhism. We will also do my best to continuously strengthen the role of Korean Buddhism for Korean society. Our Order has constantly initiated activities to protect the weaker among our society through the Social and Labor Committee. Especially, the committee has been dedicated for the victims of Sewol Ferry incident, workers of Ssangyong Motors and KTX against layoffs. As result, we have brought cooperation and agreement through a long confidence building measures to resolve the conflicts. Building on such ground, we will strengthen our activities for the neglected and weaker member of our society. We will actively promote the expansion of exchange between the Buddhist communities of North and South Korea. Establishing permanent peace on the Korean peninsula through a complete denuclearization is a crucial task where destiny of our nation lies. We will also plan diversified Buddhist exchange projects between two Koreas for successful peace and denuclearization wished by all 70 million Korean people. Through a close cooperation with the governement, we will plan establishing a templestay program in Shingyesa at Mt. Geumgang. Also, we will review temple reconstruction and reforestation project project in North Korea. Jogye Order of Korean Buddhism is the one and only Order to have transmitted the Korean Buddhist history and tradition of 1,700 years. The traditional temples are our cultural assets containing our spirit and culture. However, in some parts of our society, especially in public institutions, some people are crying out for cultural strength, while approaching Korean Buddhism of 1,700 years with the perspective of fairness relative to other religions. There is a lack of understanding for our traditional culture. Since the admission fee to the National Park has been unilaterally abolished, we have been proposing policies to the government to resolve the issue of admission fees to cultural property areas, which are constantly collected under the Cultural Properties Protection Act for the past 10 years. But the problem has not been solved yet. In addition, the government recently announced the legislative amendment of the entire Natural Park Act, and there was no process of negotiating with the Order that owns large propertise in the core of the parks. Some of the signs showing the nationally designated cultural properties on the expressway were unilaterally dismantled. And, it was confirmed through the amendment of the the local tax law that comprehensive taxation would be implemented on land owned by religious groups including on traditional temples. Jogye Order of Korean Buddhism hereby requests that the government authorities to carry out a full review of its policy toward traditional culture in order to fulfill its constitutional obligation of promoting the development and preservation of national and traditional culture. The 36th Administration which I represent will begin our duties at this critical time with a great sense of responsibility. We will consider our promise with the members of our Order more important than anything and will do our best to fulfill them. I request you that you would all join in taking the steps forward for the innovation and change of Korean Buddhism and open a brand new future for Korean Buddhism. I pray that may Buddha’s blessings surround all of you each day.